Discussion in 'Kitchen Cutlery & Tools' started by bobshoy, Jun 6, 2018. At the moment I have a pretty generic kitchen knife set in a block. As space is limited at our place I would like to make a knife block that can lay down in a draw. I'm thinking I would like it to hold 6 steak knives, a chef knife, santoku, filleting knife, bread knife and a paring knife. I think that's a good collection to do some damage. My question is though, what do you all think of a kitchen knife set that are all different brands and styles? Mine are like that, intentionally. Seesteel and hughd like this. If space is limited, why take up drawer space? Get a magnetic holder that mounts on a wall. mfunnell, Rhinoknives1, Hickory n steel and 1 other person like this. What you are looking for is an in drawer knife tray. I don't know why a set of knives should be bought as a set or from the same manufacturer. Buy knifes in the size and style that fit what you do. Economize where it make sense, likewise for splurging. A pre-made set is merely a marketing tactic. I was thinking of making something similar to what's pictured. To be honest never thought of a magnetic rack. Can they be secured with some sort of 3M strip or do they get screwed to wall? While a great idea even our kitchen wall space is only what is above the gas hob. Then it's a big window. Most of our bench space is from an island. I feel matching steak knives are a must in my opinion. I like the idea of mismatching the others. That's a nice drawer block! Most magnetic strips need to be screwed in. Any adhesive sticky enough to adhere properly would eventually tear the paint off the wall from the repeated yanking of knives. This!^^^ blocks can get gross if people aren’t careful and put wet knives in them.. I suggest Magnets to all of my customers and use them in our kitchen.. as far as mismatched knives? The Kitchen Fashion police don’t consider that a violation , so have at it! No problem Mine the same way! I have mine on a wall mounted magnet and none of my stuff matches. I buy my knives at Goodwill because you can get good vintage American cutlery for $2 and under a piece ( most were $1 and under ). I don't even use steak knives, my dinner is cut with whatever is in my pocket. Im thinking about getting some Victorinox plain edge steak knives for other people to use if I don't find a few good ones I want at Goodwill. Steak knives are something I'd like to match, so I may have to go Vic. Check out Rada plain edge steak knives. Set of 4 not too pricey, SS, American made. Might do that, I just got a Rada slicer/carver for 69¢. 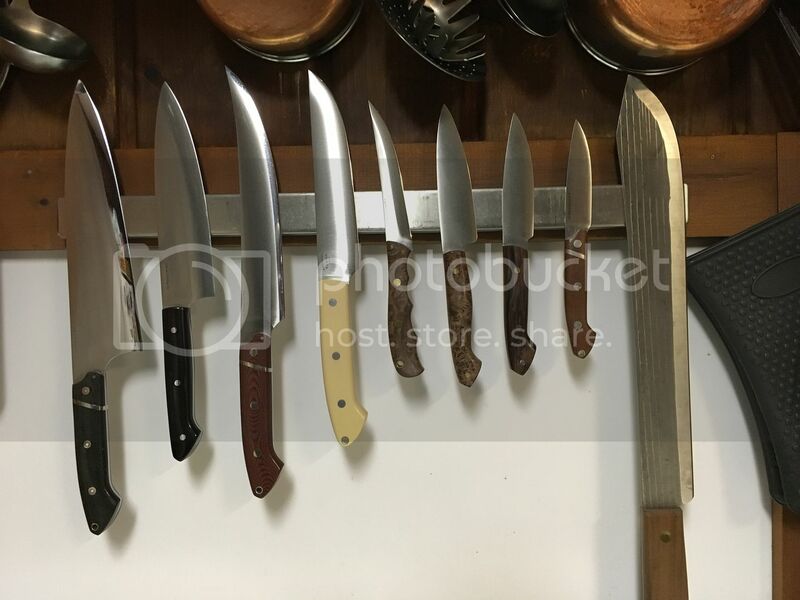 Nice looking knives, I'm particularly drawn to the 4th from the left with the ivory colored handle. Type/maker if you would be so kind. Agree that, in general, pre chosen knife sets are useless even as wedding registry gifts for newlyweds. I have lots of pairing knives. They get used as steak knives. I just got one of their steak knives today for 69¢, maybe I'll find a couple more. Honestly I'm thinking now that it would be cool for those who have a family of multiple people to actually have mismatching steak knives so everyone has their own unique steak knife. I have three knife blocks in my kitchen...U.S. made stainless steel Chicago cutlery kitchen knives and steak knives and a set of carbon Old Hickory. They work great for my needs. 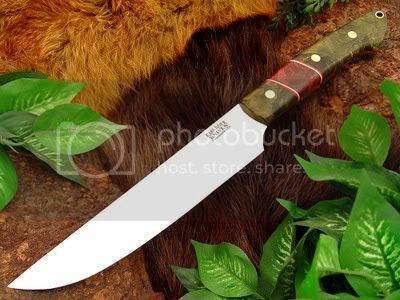 The knife in question is a Bark River, Cumberland Trail. Out of production for probably 7 or 8 years.